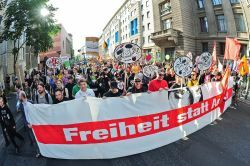 The organisers of the Berlin protest, an alliance consisting of 167 organisationen from all possible civil grous, said this was "a great success", especially considering that in the previous week, protests against nuclear power had taken place. "This proves that citizens are not tired of politics, they just do not trust the current policy", says Rena Tangens from the organizers' media team. "We now need to make sure that surveillance laws such as data retention are abolished - in Germany and in the whole of Europe." "A policy which considers everybody a potential terrorist, child abuser or murderer destroys the basis of our democracy", said Franziska Heine as part of the final speeches. Franziska initiated an online petition against censorship in the internet. Other speakers talked about student files and the electronical health card, storing information about every patient. Other activities took place in Bulgaria, Finland, Italy, Macedonia, the Netherlands, Austria, Sweden, Switzerland, the Czech Republic, and the United Kingdom. Activists had organized a plethora of events, including a full week of activities in Prague; demonstrations in Amsterdam, Stockholm and Sofia; public teach-inns in Skopje (co-organized by EDRi member Metamorphosis), Milano, and Helsinki (co-organized by EDRi member EFFi); privacy parties and film screenings, and much more. Activists in Vienna (from EDRi member Vibe.at) reported such big interest from the population that they had to print 1000 more leaflets on the same day. Outside of Europe, privacy activists in Guatemala joined the action day this year with a reading event from a new volume of fiction stories about surveillance, titled "stop the surveillance mania".